About this iconic tree there are many myths, stories, and interesting and fun facts about its history, habitat, uses, and more! There are nine types of baobab trees in the world. Six are in Madagascar, one in Australia and two on mainland Africa and the Arabian Peninsula. 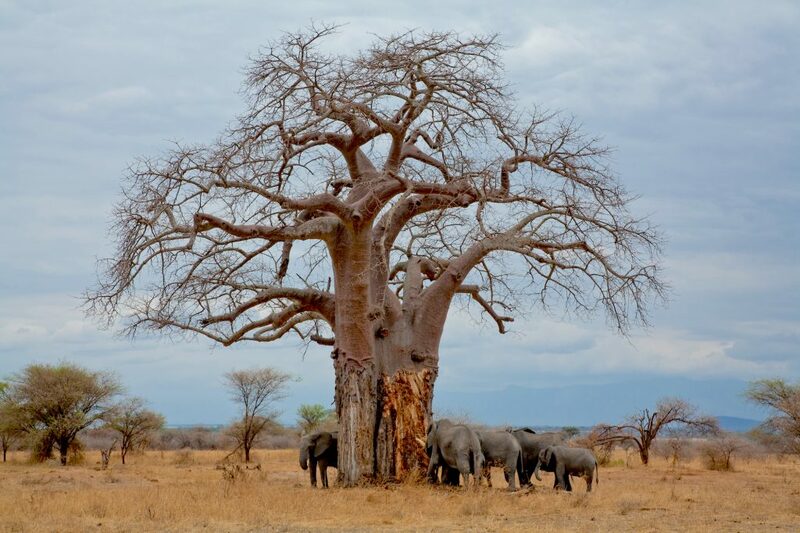 The ones found in Tanzania have the scientific name adansonia digitata and are the largest of all varieties. Baobabs are often referred to as upside-down trees, because of the root-like appearance of their tangled branches. Baobab trees grow in hot and dry woodland environments in areas that receive low rainfall. They begin flowering at around 20 years of age. During the southern hemisphere summer, the tree produces very large and heavy white flowers. Their crinkled petals and large clusters of stamen give baobab flowers an exotic appearance. They open during the late afternoon and stay open for one night only, emitting a strong and stinky odor. Flowers attract fruit bats and various insects. The seeds are located in pods, and the resulting fruit is gray and hairy. The baobab has the only fruit in the world that dries naturally on the branch. It will not drop, but rather stay on the branch and bake in the sun for up to 6 months – transforming its green velvety coating into a hard coconut-like shell. The pulp of the fruit dries out completely. This self-drying fruit simply needs to be harvested, de-seeded, and sieved to create a fine powder used in cooking or as a health supplement. The baobab is often referred to as the “Tree of Life” as it provides life-sustaining shelter, clothing, food, and water for both humans and animals of the African savanna regions. The bark is fire resistant and is used for making cloth and rope. The leaves are cooked and eaten as a spinach-like vegetable or used as condiments and medicines. The fibrous pulp that comes from the bark is used to make paper, clothing, grain sacks and fishing line. The sap is used to make glue, rubber and soap. 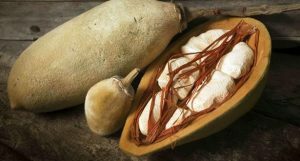 The baobab fruit is rich in vitamin C (more than an orange or kiwi!) and readily eaten. The sprout of a young tree can be eaten like asparagus. Oil extracted from the seeds is used as a moisturizer. In seasonally arid areas, Baobabs can store water in their trunks (up to 4,500 liters / 1,200 US gallons) to endure harsh drought conditions. This water has two functions – to keep them standing upright and to help them flush new leaves at the beginning of the growing season. The size of a tree varies, as it can shrink and expand depending on its needs and the amount of water it absorbs. In the dry season the trunk shrinks; when water is abundant the trunk expands to support more water storage. Another giant in the bush can cause great damage to baobabs. Because they know that baobabs store water in their trunks during the dry season when water is scarce, elephants look for baobab trees to quench their thirst. The bark of the baobab is soft enough for an elephant to poke a hole through it. Once this protection is gone, the elephant has access inside to the best part where water is stored. It is believed that an elephant frightened the maternal ancestor of the baobab. In some places the baobab is worshiped as a symbol of fertility. It is a belief among certain people that spirits inhabit the flowers of the baobab and that any person who picks a flower will be eaten by a lion. Some people think that if one drinks from water in which baobab seeds have been soaked, they will be safe from crocodile attacks. It is also believed that a man who drinks an infusion of the bark will become strong. In some areas, a baby boy should be bathed in such a bark infusion, as this will make him strong; however, he should not be bathed for too long or he may become obese. Many tribes believe that the baobab once grew upright, but it considered itself so much better than the lesser trees around it that eventually the gods decided to teach the baobab a lesson. They uprooted it and planted it upside down in order to stop its boasting and teach the tree humility. Another myth claims that long ago the very first baobab caught sight of itself in the lake surface. It started complaining about being fat and wrinkled. As it wouldn’t stop, the Creator replanted the tree upside down and it has remained silent ever since. 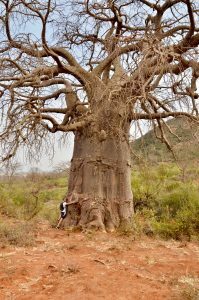 Large baobab trees with hollow trunks have been used by people for centuries for various purposes, including houses, prisons, pubs, storage barns, and even as a bus stop! 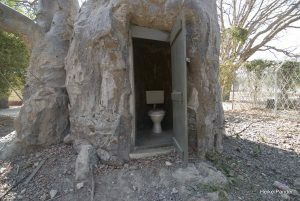 One tree in the Caprivi Strip (part of Namibia located between Botswana, Angola and Zambia) was converted into a toilet, complete with a flushing system! A huge old baobab in the former Transvaal region of South Africa is recorded as once being used as a dairy. Not only do humans make use of the tree, but animals of the savanna regularly use it for shelter, while African honey bees often utilize hollows in the baobab to make their hives. Try for Yourself… Baobab Smoothie! 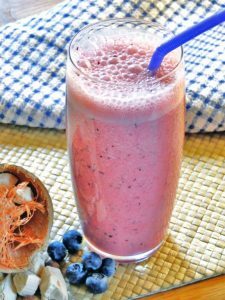 Combine the yogurt and apple juice in a food blender and stir together. Add banana, baobab pulp and blueberries and puree until smooth.